Harmsco® Filtration Products has developed the Harmsco Homeland Security Water Filter Appliance. Designed to protect homes at the point of entry, these appliances utilize a multi-technology, flow-through barrier cartridge filter along with a powerful ultraviolet disinfecting reactor in one convenient unit. 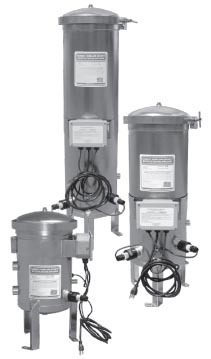 The family of Harmsco’s Homeland Security Water Filter Appliances consists of three different size models (5, 10 and 15 gpm) to fit any home’s needs.